00:27 SHARON: Hi, I’m your host, Sharon Tewksbury-Bloom. Today’s podcast is brought to you by the Do Good, Be Good AmeriCorps Training Series. More on that later. My guest on this episode is Vicki Anderson. I met Vicki when she applied to serve in AmeriCorps VISTA. I had just launched a STEM Education VISTA Project in Flagstaff, Arizona, and Vicki was one of our first VISTA volunteers. STEM stands for Science, Technology, Engineering and Math. And our project worked to get more girls and underrepresented youth involved and interested in STEM fields. I was really excited to have Vicki in the program because she had actually already served in VISTA back in the 1970s when the program was fairly new. Also, Vicki had served in the Peace Corps, and she had managed an RSVP volunteer program for seniors. So Vicki is very committed to service and in this interview today, we just scratched the surface of her lifelong experience of working for the greater good. I started by asking Vicki about her childhood, moving around the United States with her family. 01:39 ST: Did you move around for any particular reason? 01:42 VICKI: Basically my father worked in insurance and he kept getting promotions, so we moved from Pennsylvania and to New Jersey, back to Pennsylvania, to all different locations. He’d get a promotion and, okay, we all get our stuff together and go move. And finally, he got a really good job back in Erie, Pennsylvania, where I was born. 02:05 ST: Was social work what you were studying in college? 02:09 VICKI: Well, I wanted to be a nurse, so I went into nursing, did pretty well the first semester and then I kind of fell in love, and then I got a D in Biology and they said, “Oh, you’re gonna have to wait a whole year.” And I said, “I’m not waiting a whole year. I’m gonna switch my major.” I went from nursing into education and then I thought, “Oh, I don’t like this either.” It was the ’60s. So I got into social work. 02:35 VICKI: No, I got a better grade. [laughter] I brought my grade up. I love, I love science. I really do. And it was just something where I, I don’t know, I just went off the deep end and it was the only D I ever got. Timing was, you know, it was hard to get into that nursing program and I was on probation and I said, “Oh, I’m not waiting.” ‘Cause I was the first person who ever went to college in my family and I thought, “I can’t have them waste all this money.” So it was okay because you don’t really know what you wanna be. A lot of people don’t, when they first start out. 03:05 ST: Well, that interested me too, just because of the work we do now with STEM and trying to get more women and trying to get more people of color to go into STEM fields. I only maybe recently realized that I started out as a STEM major in college and ended with a Bachelors of Arts, [laughter] with the history degree and I thought, “Huh, I don’t think of myself as sort of a failed STEM candidate.” [laughter] And yet, if I was looking at me as a statistic, I certainly would fit the bill of someone who started out with… I’m sure other people’s hopes and dreams of maybe becoming [laughter] a STEM major. Did your parents have say or an opinion about your career path and the fact that both of you went to college, and you switched your major to Social Work? 03:54 VICKI: Well, I think that they were kind of… I don’t think anybody in my family went to college. All my other relatives and they were just like, “Okay. This one is gonna make it.” And so I think my dad’s opinion was, “Well, just find some… Find a man that has a good job.” So he was like, “Connections,” and things like that. But my father always wanted… Because it was hard for them, they didn’t really make that much money and it was… I didn’t realize it then what a struggle it was for them to put us through college, all four of us. And later on in my life, when I’d just called back my mom would say, “Okay. I’m thinking you’re doing this. What are you doing now?” It was hard for them to keep up, but it always… My mother was really a kind of an adventurer in a lot of ways, and I think in a lot of ways she lived through me. My father was more like, “Find a man, get a good job, have a future,” you won’t have to worry about me, I guess. I think it’s different nowadays, because you have to spend so much money with your college. But back then, it was so much cheaper. I just think it’s a lot easier back then. 04:52 ST: I asked Vicki why she chose to join VISTA. VISTA stands for Volunteers in Service to America. It was started in the 1960s. And the program is designed to alleviate and eliminate poverty. 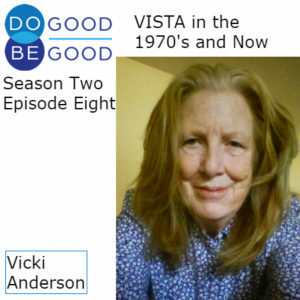 We’ll have more information about VISTA in the show notes at dogoodbegoodshow.com. 05:13 VICKI: So, rights and all those things were happening in the ’60s, and I just thought… I didn’t even know any African American people at all, and my family was kind of prejudiced against a lot of that. And I said, “I just wanna get out there and do something where I’m working with people so I can really make my own opinion.” And so I joined VISTA then. ’71 is when I finally graduated, so from ’71 to ’72, I worked in St. Louis, Missouri. We moved around a lot, but our family was still kinda close suburban type. To move to St. Louis, Missouri, was a big, big change. 05:45 ST: And you had never been to Missouri before. 05:50 VICKI: Yeah. No, no. 05:51 ST: What was it like, a week long pre-service orientation? 05:54 VICKI: It was two weeks. 05:55 ST: Oh, two weeks. Nice. 06:40 ST: How many of you were there? 06:41 VICKI: Our group that went was 25. I do remember there was like a few of us that said, “Let’s kinda stick together” you know? And so it turned out some of the girls and this one VISTA guy said, “Well, let’s go together.” So we started panhandling and people were just so mean to you. I was like, “Oh my gosh, I just want a quarter, how about that?” They’re like, “Get away, you jerk.” [chuckle] So, I mean… And then you had to find a place to eat with no money. You had to fend for yourself. You have to sleep and we had a thing, “Well, okay, let’s go to the mission,” you know. Everybody kinda brainstormed because we didn’t really know St. Louis either. We had made up a story that we had car trouble and we were stranded there, and we had to fend for ourself until our parents sent us some money. And first we went to a mission and the mission they just treated you terribly really. It’s like, they made you go through this church service first and there was all these people that were drunk and just sitting there, just trying to listen to this lady play the piano and this other guy do a fire and brimstone and they’re like totally out of it. 08:24 VICKI: I know. And they’re all laughing and she goes, “Well, I’m gonna go call someone.” And I was like, “I think we should get out of here, guys. This lady’s… ” I feel like she’s gonna kidnap me. I felt, you know, really threatened by her. So we went all out and so then panhandled some more. My one friend, she said, “I’m gonna give blood, I’m gonna give plasma.” And she’s this really thin girl from Montana and I said, “I’m not giving my blood. I don’t wanna do that and she ended up fainting and it was just… [laughter] ‘Cause like now I look back and think of all the needles and everything back then and it’s like, “Oh gosh.” So then our best luck was with Salvation Army and to this day I also give them money anytime I have any money because we went there and they were just so nice. No questions asked. They gave us a meal ticket to go eat at this, you know, small little diner. And then they gave us a ticket to go stay in these cots. All the women were together and all the men. And I mean no questions asked. They didn’t, you know, make us prove that we’re religious or whatever. 09:20 VICKI: And my friend and I got to the barracks, the dorm, and we said, “This is too easy. We don’t wanna just do this. Let’s just go out and walk some more and find something else. And, oh, let’s sleep in the park or something.” Which really wasn’t a good idea so we didn’t do that really, ’cause then after we saw so many different people there. So we said, “Well, let’s go to the bus station.” Then, St. Louis had a huge train station, so we just said, “We’ll just go there and sit, nobody would bother us so we can just sit and take turns.” And I said, “Okay, let’s, you go sleep first in the rest room and I’ll just wait.” The lady that worked there, cleaning the floors and stuff like that, she just thought we were like prostitutes or something. And she goes, “You’re not supposed to be here.” And she kept slamming all the marble doors and we couldn’t really get to sleep at all. 10:08 VICKI: So then she got the police. We were outside in the train station and they go, “What are you doing here?” And they’re just like, “You’re not allowed to just stay here, you’re vagrants.” Or like, “Oh my gosh, you know.” I was just… We’re just… I said, “Well, our train is… We’re just gonna wait, the train is coming in… And we’re making all these stories up. I’m sure he didn’t believe anything. He says, “Well, you can’t wait here, you gotta start, you gotta go.” So we just started walking and went all around and the next morning we ended up meeting all the other VISTAs at the park, and everybody had different stories of what went on. So it was a really good experience of really feeling how worthless you are just ’cause you don’t have any money and even if you know inside you’re a good person, some people won’t give you a dime even. And so it was like, for me, it was an important experience. 10:57 ST: Season 2 of Do Good, Be Good is sponsored by my AmeriCorps Webinar Series. Do you work for an AmeriCorps Program or State Commission? Contact me at connect@sharonspeaks.com for more information about hosting a live webinar or your AmeriCorps site supervisors or members. Topics range from member retention to conflict resolution and everything in between. That’s connect@sharonspeaks.com. Mention this podcast for a 20% discount. 11:29 ST: What did you actually do for your VISTA service in that first term? 12:40 VICKI: And I had a bunch of teenagers and we were trying to work together as a group. One of the things we’re trying to do is get notebooks and paper and I took all the girls that I was working with and some boys in a group and we were gonna get all these notebooks and get everything organized, and we went in and I said, “Okay, you guys, go get your stuff, I’ll meet you over here.” And so we got in there, so I’m just getting things and then this door security person came up to me and said, “Come with me.” And I go, “Oh, what’s… Why?” And he’s being so rude. “You need to come with me right now.” He thought I was leading the group of kids, and I was… But a couple of them had done some shoplifting. 13:22 VICKI: So I said, “These kids haven’t done anything.” And I just thought, they were really picking on them, “What do you mean?” you know. They had little things like hair gel and I’m like, “Oh my God, I can’t believe this, you know.” And so after, you know, I showed them I was a VISTA volunteer blah blah blah blah, they had to give all the stuff back and ended up the one had to go and got a record because he was 17 or whatever. And they were so mean, the police, they were just really mean. But, you know, I was so young, and I’m thinking, “Why?” These kids… They just made bad choices. So I thought, “Well, maybe I’m not good.” Because another thing too, I was so young, I looked like I was in high school. All the guys kept hitting on me. I’m like, “I don’t think I’m helping anyone because they’re getting mad at me because I won’t go out with them or whatever,” you know. And so I said, I don’t think this is good either. 14:06 VICKI: So I ended up working, before they had a Meals on Wheels Program or Senior Citizen Program, I worked with senior citizen population, which is amazing, ’cause the women there are the solid focus of the community there and it’s really sad because the men can’t find jobs, so the women get jobs and the men don’t. And there’s that whole kind of cyclical pattern of self-esteem ’cause there’s no jobs. But I worked with the different churches that had kitchens and we worked on working through the Mayor’s Office on Aging and that’s before they had Meals on Wheels and the Senior Centers and things like that. So all the women worked together of getting donations of food and then we deliver it or people would come to the center, so we ended up getting a lot of community women to work together to get a Meals on Wheels Program. 14:53 VICKI: At the time, we got also buses out of the city to Good Shopping, ’cause they only had small grocery stores and everything costs a fortune and a lot of times the senior citizen’s paychecks would be stolen out of their purse or even the car or whatever. And so we got a chance to get them out of the city, to go shopping, so we got a whole senior program going pretty well, and the women were amazing that just make all these rolls and all this chicken and everything. I was like, I learned a lot ’cause in my mind was, “How could kids earn money? How could people earn money?” And I remember one woman, I said, “Well, what about a paper route?” And she goes, “I’m not gonna have my kid stabbed for fifty cents collecting money,” you know. 15:36 VICKI: So there’s just so much that I learned there because you weren’t secluded. You could hear guns down the street. My car was bashed in twice, my poor daddy’s insurance… And the head of the company used to watch all the claims and so I had two claims and he kept saying, “What’s this claim, Richard? What’s this claim?” And my poor dad was like, “My daughter’s in St. Louis and blah, blah, blah.” Anyway, I met some wonderful African American ladies that I worked with and I totally loved and I learned more than I could have helped anyone. It was just an amazing experience. I wanted to do it again just because I like to be around people that like to think out of the box and do something different. Being older, it’s nice to be around young people that still want to do something. 16:26 VICKI: And it seems like, they wanna try something different. There’s all different things you can do. You can still make the same amount of money working for Burger King, but it’s like people that are a little bit out of the box. That was the same thing in the Peace Corps, too. I think they’re unusual people that would take their time out to do something and it’s not the easiest job and sometimes it’s rewarding in some ways and some other ways. When people see the word ‘volunteer’ they think, “Oh, you can’t get a job, huh?” And it’s kind of interesting, even from the Peace Corps, and even VISTA, that a lot of people change their lives as far as other things that they went into after it. Because you’re just not the same in some ways of, the experiences you get make you a broader person. It opens your eyes too if you’re immature. 17:12 ST: I asked Vicki, what she plans to do when her current term of service is over. 17:26 ST: What does it mean to you to be good? 17:29 VICKI: The fact is that, what you get out of something is what you put into it, and that I don’t… I’m not goody-two-shoes, you know. I’m still egocentric in a lot of ways, but I just think if everyone… I was just thinking how the Rockefellers they have money and they do things. I think, “Why do these people do things” you know? That everybody can be their own little Rockefeller. No matter what you have, you can give something to someone. And you may not have all this money, but you could do something because when you do it, it’s the whole thing of, you do feel good inside, it’s from you that you get it from. Everybody could all take a turn and do something. 18:17 VICKI: We had a Crisis Residential Center at our house for three years, and I could never do it again. We had 150 teenagers come through and they were having trouble with their families. But if everyone does their share somewhere along the line, it all can be better. My daughter was laughing the other day. I was getting a little bit of this money for this Valentine Party for the kids ’cause they really want it and I said, “Well, it’s like the Rockefellers. They give. They have some money. You have some time. You have something. Give it and then you get something from it.” It doesn’t all have to connect. We’re not so down and out that every little penny means something or every little minute of your life means something, to yourself, you could give something to someone else because it all evens out in the end if everybody works hard on it and it could be a beautiful place. 19:11 ST: I feel like we need some sort of graphic at the end. 19:13 VICKI: Yeah, everything is beautiful as always. 19:17 ST: Thank you for listening to Do Good, Be Good. For show notes on all of our episodes, visit dogoodbegoodshow.com. And if you want more conversation and behind-the-scenes insights, come over to our Facebook page at Facebook.com/dogoodbegoodshow. Thank you so much to Vicki Anderson for coming into the studio and sharing your stories. To subscribe to this podcast, so that you get each episode as soon as it is released, search for Do Good, Be Good in Apple Podcast, Stitcher, Google Music or any place that you find podcasts. In fact, if you don’t find the show, please let me know. Email me at connect@sharonspeaks.com. This podcast was produced with help from Sun Sounds of Arizona. Music in this episode is Bathed In Fine Dust by Andy G Cohen, released under Creative Commons International Attribution License and discovered in the Free Music Archive. Until next week, this is Sharon Tewksbury-Bloom signing off.